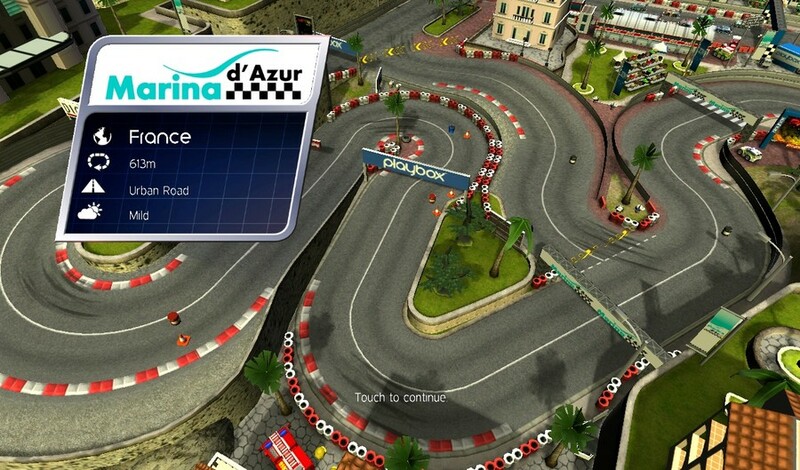 It’s been a quiet but rewarding road for Tegra 2 Tablets over the past few months, with little optimised games being released but most being great to play, the wait for the next big game is almost unbearable and I have been waiting for this game to come out for Android ever since I heard about it, the game looks crisp and fresh and definitely one of the most promising looking Tegra games to be announced. First are the controls… The controls have had a lot of stick but Playbox released an update to give us 4 control styles instead of one, I can’t put into words how much better this makes the game and how much easier it is to play in different positions. The default control scheme is to touch where you want to go and drag closer or further away to change speed. This was previously the only control scheme and it works but it’s not for everyone and takes a bit of getting used to. Thankfully the other control methods are more conventional and all work pretty well too, you’ll find your way with one of them. 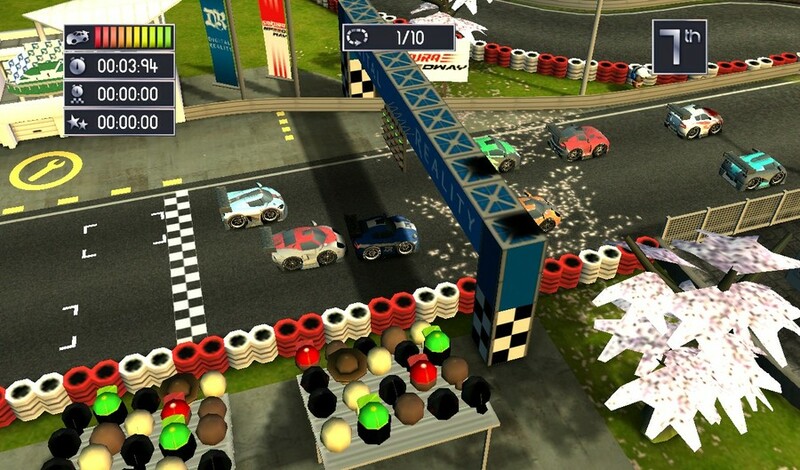 The graphics in Bang Bang racing use pretty much all of the power that’s built into Tegra 2 and squeeze out a beautiful looking game. From the moment you enter a track with a sweeping overview of the track you know this is something special. 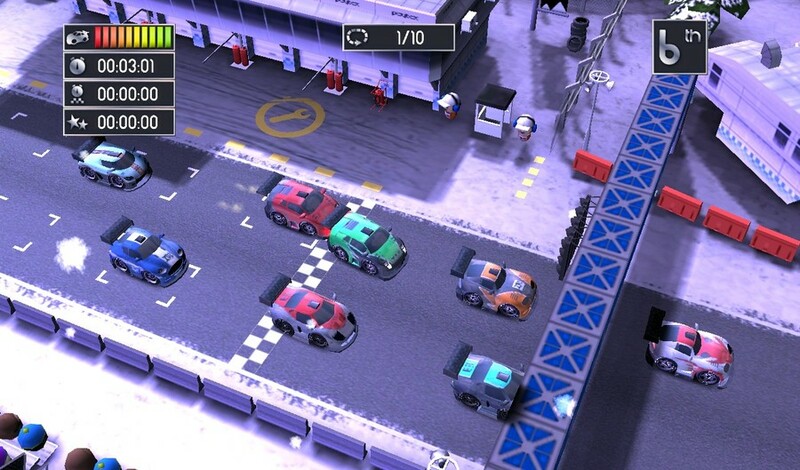 Playbox have also put down some really nice car designs, they look sporty and cute at the same time, it helps to remind you that this isn’t a serious racing game but a fun frolic with cars. Playbox have done a great job with the 8 available tracks, each one has it’s own personality and feeling, thanks to the different lighting conditions and detailed features you get a lot of variety when going through the championships. Tracks can also be played in reverse so you get 16 tracks for the price of 8. 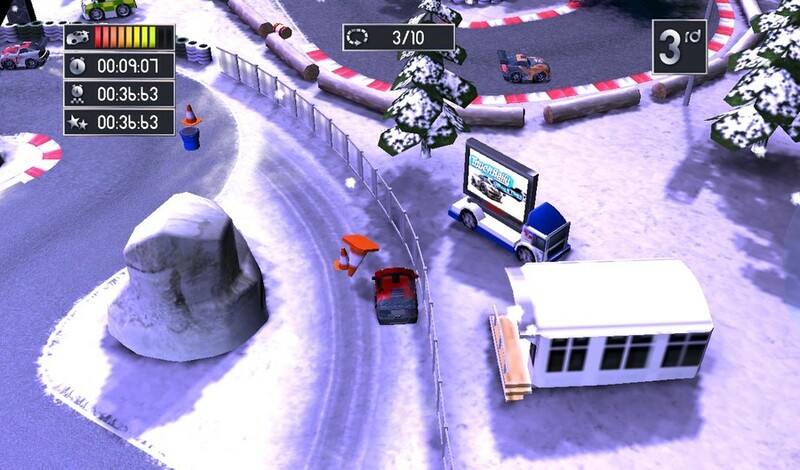 Most tracks also have a lot of shortcuts, this allows you to sneak ahead of the competition and the overhead nature of the game means shortcuts are easy to see but not always so easy to take! Many time’s I’ve decided to go for the shortcut too late and hit the tire wall and I like that, it adds some risk/reward to the play. The other thing you may notice is that there is not map for the track when racing so you have to guess where you’re going until you learn the tracks and I personally think it’s probably a good thing, once you’ve played them a few times the tracks are pretty memorable so you get that feeling that experience is paying off and learning the track is rewarding. 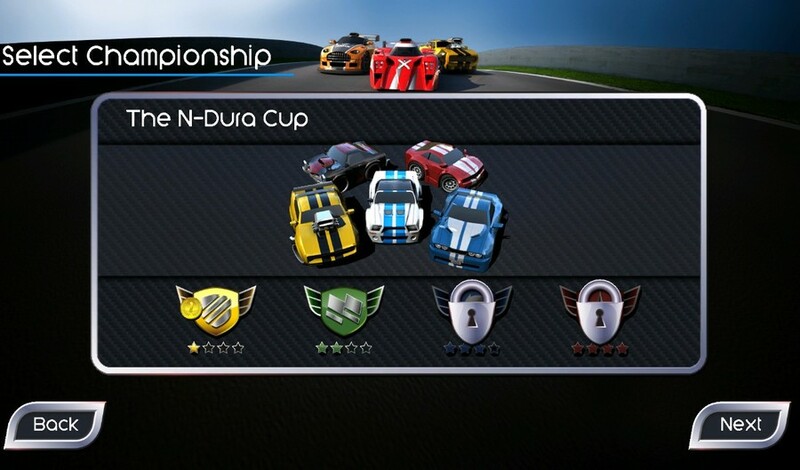 The game itself is mainly about the championship mode with 4 different championships which will take you through all of the courses and all of the available cars. It’s nice to have so many cars to choose from and such a variety so as you progress your cars are getting faster and you don’t have to use the same one twice. I love the design of the cars too, they manage to look quick and stylish but also retain that micro machines type shape giving an air of fun. 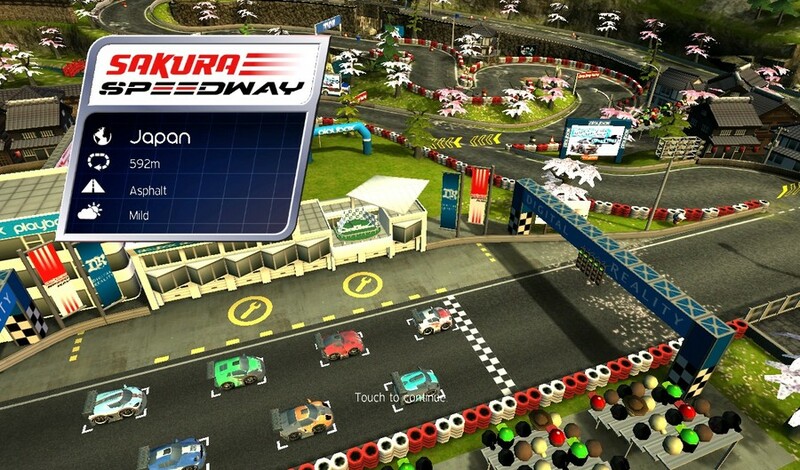 I guess the last thing to tackle is the audio, there’s not much to say about it really, there’s a nice music track when you’re racing through levels and sounds to accompany every vehicle but nothing really stands out in this regard and that’s not a problem either, the music and sound seem to fit very well with the feel of the game and never get too risky. 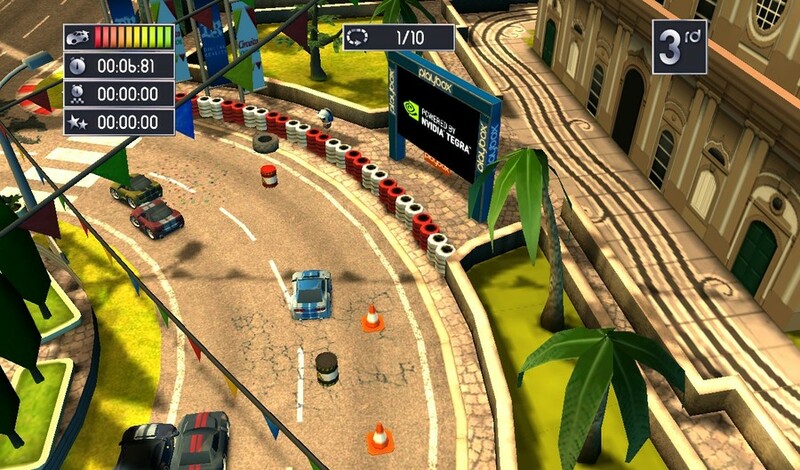 All in all Bang Bang Racing is a great addition to the Android line up and the best looking racing game on Android with a lot of fun to be had if you stick at the controls and give it a chance, worth every penny at the current price of £4.90.